Publisher: Commenting at SteamboatPilot.com? Must authenticate yourself to Facebook! BUSINESS INSIDER, Facebook is asking some new users for their email passwords and appears to be harvesting their contacts without consent April 3, 2019 — Electronic Frontier Foundation security researcher Bennet Cyphers: "This is basically indistinguishable to a phishing attack." 30% of Steamboat Pilot & Today's daily issues published January through February — 18 in 59 days — were printed on 5 broadsheets of four pages each. Our calendar and tallies first displayed here midday February 28. 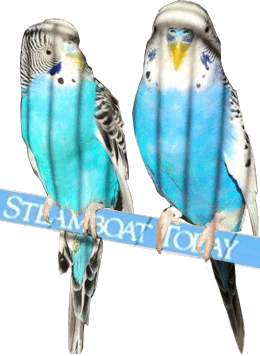 Steamboat Pilot & Today's 24 page/day minimum rebounded March 11, until April 7th's & 9th's 20 pagers. In the world of newsprint journalism today, a paper's Heft = its Health. Of the 62 days from the first to the final red square in the calendar count, issues ending at Page Twenty totalled 22, 35½%. EVERY Thursday issue from January 17 through March 7 was a 20 page lightweight — an 8 week streak. In 2018 the paper dropped its Sunday pay-to-read-in-print model. Sundays are now give-aways, just as the Monday through Saturday papers have been for years. 5 of the 6 Sunday issues from February 3 to March 10 matched the 20 page minimum — a nickel a page at Sunday's newsstand price in 2018's first quarter. The News is in Peril when readerships pay nothing for product. Though socialists push a dream everything ought to be free for everyone, free = worthless in practice. Someone pays until they don't or won't or can't. Advertising occupied nearly half this issue: 9½ pages worth! Self-promotional content including mastheads filled close to 3 pages. News articles with images came in third with slightly over 2½ pages. The events calendar (orange) merited 1⅓ pages. Commentary (red) and Sports (purple) one page each — Comics & Puzzles amounted to ¾ page — Public Service content was a half page; Weather a bit less. Advertising matters. Trust a local monopoly & its giveaway news jammed with ads at your own peril. Among its quarter-page, color ads for a host of moonlighting services, Steamboat Pilot & Today identifies Reputation Management as Problem Number 1 it can remedy. Hire them to help you scrub unfavorable online reviews about your business. The paper takes a snarky pride in its ability to magically bleach appearances for a price, but is its news reporting as honest as you deserve? Read with care and you'll find posturing that promotes groupthink idealism and subtle bias disguised as an Orwellian public service: Read the Free Paper at times sanitized in your best interest, fully financed by ads and side services. In a front page column on the 5th of July, editor Lisa Schlichtman opened by recapping what led up to the murderous rampage of a madman in the Capital Gazette Annapolis newsroom a week earlier. While I share her grief, she pivots to an emotional defense of herself and her team, "...we're not immune from gun violence." Blame the sick perpetrator Jarrod Ramos, not his weapon! Lee Harvey Oswald and John Wilkes Booth assassinated U.S. Presidents. Are word processors and notebooks responsible for slanting the news? Schlichtman's third paragraph concludes with an apparent swipe at my fact-checking work: There's even a website, created by a critic of the newspaper, that is devoted solely to letting people know just how bad this person thinks I am at my job. I've practiced journalism almost twice Lisa's 25 years in the saddle. For me integrity comes first. This website is not solely about her, however she serves as the Pilot's Pilot and must take responsibility for poor navigation choices grounding Steamboat's news into a mudbank. My main beef is most American news media marginalizes a once-honorable profession with liberal delusions of grandeur-(Politico) eroding the public trust. As I see things Steamboat Pilot & Today is a microcosm mirroring perverse national news groupthink. I believe she betrayed a duty to enforce newsroom discipline, lacking the backbone to prevent bias at the end of May 2016. At her urging in an email she sent, I submitted a letter-to-the-editor about concerns I had verbalized on the phone. She flatly ignored my literary warning shot across her bow by cavalierly 86'ing my remarks. Careful readers might recall the news reporting that prompted my letter. Upon my submission, her paper's online comments section censored me from posting, but my freedom to speak out cannot be silenced here. On the evening of March 27, 2018, I emailed both her and departing publisher Suzanne Schlicht requesting an apology for, and retraction of, the racist Wolverton political cartoon published 3 days earlier, premised on FAKE NEWS about the Austin bomber. The internet is agnostic. She can make whatever claims she wants about purity of purpose and ignore news she deems politically incorrect. Guided by SEO keywords, readers are here learning how journo-sausage gets made by a member of her profession who understands the manipulation and vindictiveness of liberals in media. I illuminate a dark agenda fooling us. The news needs gadflies. Whenever Lisa or her reporters commit journalistic malpractice, other journalists are obliged to correct the record. Plastered on her newspaper's front page Lisa Schlichtman's ¶3 lists unnamed parties gnawing at her thoughts starting with "a gun-toting murderer" and ending with, presumably, SteamboatYesterday.com. In between Lisa lists "a sawmill owner who took a swing at me", written threats from newsworthy criminals and angry political voicemails. In the public eye journalists must tolerate cranks and worse, but in our free country reporting the news is worth it. When I see injustice I apply my competence, training and experience without resorting to violence, sanitizing reputations or waffling on news ethics. I believe journalists who intentionally spin, distort or bleach the truth deserve to be tagged as PUBLIC ENEMIES despite Ms. Schlichtman's forceful denial. If I'm basing these comments on faulty facts, please alert me to the specifics. I pledge to remove any falsehoods, but facts that are verifiably true, I shall defend. I make this offer despite Ms. Schlichtman's having shown NO reciprocity acknowledging my complaints since noting her paper's May 2016 smear of 2 Steamboat school board members standing up for taxpayers against a powerful teachers' union, clamoring for higher pay at every bargaining opportunity. By refusing to acknowledge complicity in advancing clearly biased reporting, arrogant newsroom offenders invite public outrage and revolt. Remarking on 2018's Q2 staff departures of its publisher and 4 reporters, Pilot and Today editor Schlichtman acknowledged in New team, same mission on the front page, "...smaller daily newspapers often serve as training grounds. Journalists work several years at a smaller publication and then move on to larger papers or bigger opportunities." Weeks earlier she wrote this commentary: "...news organizations must hold themselves accountable to standards of fairness, objectivity and accuracy to earn and retain the trust of readers. Especially in the era of 'fake news,' it's critically important for journalists to be above reproach." This is the same woman who urged me to summarize my 2016 critical analysis of newspaper bias in a letter-to-the-editor. Not only was my essay ignored, my online log-in privileges were revoked. So much for OP-EDS! As the paper gets skinnier, its excrement pile deepens. In pitching its sidecar services boasting of expertise in all things internet, for months past Tax Day the paper ran a self-serving ad featuring a grimacing lad, ashes on his face, made-up as a Red Devil, captioned: "Why are you trusting just anyone to manage your business's search-ability online?" That's the paper's compelling pitch to hire their people advertised as experts. It's ironic a gifted, child prodigy might actually BE a better choice than the paper's designated tech moonlighter. At least the kid'll be around town for awhile. Until May 4 Ristow was listed third on the paper's contact directory, usually a left page's left column (ironic, no?). She was the paper's Digital Engagement Editor until then, heading its colorful ad campaign to trust its personnel's expertise with your digital solutions strategies. How about mission-critical issues such as CONTROL over not repeating dated sports reports? Perhaps Ristow's replacement, Nicole Miller, will code a failsafe to prevent the reprinting of dated articles days later, that is while fulfilling Digital Engagement Editor duties while management outsources staff on projects for which it claims expertise. Steamboat Pilot & Today's SPORTS, page 9, right column, Saturday, April 21, ran an ENCORE of its Avalanche report of 6 days earlier! The copy desk even continued the stale story on page 10. In fact, AVs won Friday night, 2-1, but THAT NEWS went unreported in the morning's print edition. (Nashville won in a 5-0 shutout Sunday night, ending the AV's season.) End-users place zero value on free product. Just as the Chinese space station's lowering orbits forecast its destruction, Steamboat's newspaper wobbles before its inevitable crash into chaotic and irreversible irrelevance. The other headline read: Sunshine likely to be interrupted by snowfall. Imagine that phrase's potential! Sunshine likely to be interrupted by nightfall or Sunshine likely to be interrupted by clouds or Sunshine likely to be interrupted by a solar eclipse. Endless possibilities!